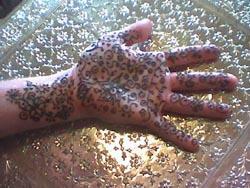 Here is a photo of an original henna tattoo design. The customer wanted something lacy and flowing, similary to the design she got in India while on vacation. This design covers the wrist & hand, and is photographed on a beautiful white metal table, just one of the many imported treasures from KooKoo bean. As it is now the end of henna season here in Jacksonville, I will only be available for henna tattoo for parties and events until next summer! Call the studio at 904-993-7466 for more information.